Larger features like Online Invoicing transform how you work with your customers. But we also focus on delivering smaller updates to improve important workflows and make things easier for you. That’s what this release is all about. If you’re a small business that invoices the same services or products time and again, copying an invoice saves time. You can already copy an individual invoice within Xero. But you had to open the invoice and then copy it – which takes time. 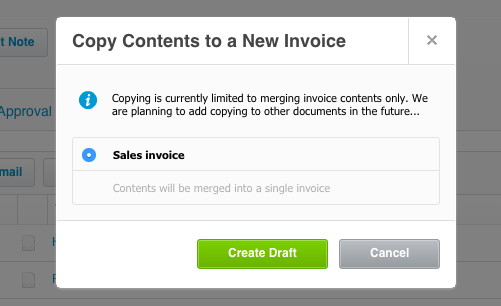 You can now copy an invoice right from the sales invoices page into a new sales invoice. Select the invoice, make a few tweaks, choose the contact and you’re ready to go. You’ll save time, your invoices will be accurate and you’ll get invoices out faster than before. You can also copy multiple invoices into a single invoice. We also know there are many businesses who prefer to invoice less frequently. Either because that’s what your customers expect, or because you want to reduce administration for you and your customers. With this release you can consolidate a number of invoices (in any state – draft, approved etc.) into a new invoice to send to a customer. Using the ‘Copy to…’ button, you can copy up to 25 sales invoices – or a total of 200 lines – into a single invoice. This makes it easy to invoice a customer in one go. Sometimes mistakes can slip through the cracks. Sometimes you might misspell a contact name, or need to change the due date etc. on an invoice. For your peace of mind, all changes are tracked, so you can easily see who has made changes. A few releases back we updated the Account Transactions page. We wanted to take advantage of the larger screens many of us work with. We made the page responsive to the size of your browser . This meant it grew wider if you had the space on-screen, making it easier to read. With this release, we’ve done the same to the Sales Invoice pages. We’ve not only made them responsive, we’ve also cleaned up the design. More space means it’s easier to get the information you need to make decisions. This should save a few seconds each time you want to create one of these items.